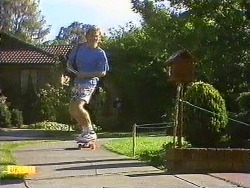 The first show of the year opens with a demonstration of Scott's skateboarding skills as he delivers pamphlets to the houses of Ramsay Street. Where Madge and Helen are taking down decorations and filling the viewers in on the fact that Paul and Gail are in New Zealand on Honeymoon. Henry traipses in all sunburnt from mowing the lawn with no shirt on. Helen offers to rub calamine lotion on to his tanned, toned, torso and he gleefully skips off the get a shower. Helen reads out a postcard from Lucy, revealing to us that she's been staying with Rick (from the hospital) during the holidays. Madge leaves her to the postcard and trudges out to the garage with all the decorations - determined not to be a burden while she's staying there. Mrs M reassures him that she's talking about that wretched airline pilot, not him. She doesn't like him, he's smarmy. Harold reassures her that Jane's a very sensible girl and won't let that man make a fool of her. Jane is letting that man make a fool of her. It makes me feel worse watching them than it does Mrs M thinking of them! Glen chases Jane into the inner office where they discuss Jane getting time off work - Glen tells Jane it's too late, his holiday's almost over and he's off back to New York. He thinks Jane should think again about the modelling contract but she is insistent that Erinsborough is where she wants to be. In that case, Glen tells her they'll have to make the most of the time they've got left, starting with lunch, then dinner the next night - in his hotel room. Dirty old man. Jane is not keen but he talks her round with the oldest line in the book - she's different to all the other girls he's met. Jane the superbrain falls for the line and agrees to go, silly girl. Nel has come round to visit Eileen but Mike tells her she's taken Malcolm to see Beverly with his leg. The pups start barking and Mrs M asks if Mike's found homes for Pembroke yet - he hasn't found homes for any of them. 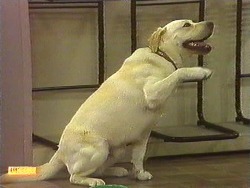 As Mrs Mangel is leaving she sees Bouncer wave to her and calls Mike over in amazement. He thinks she's had too much sun. Paul carries Gail over the threshold and chucks her on the couch. He tells her he has to get off to work (Oh Paul!) but she tells him no way. She wants him to help her unpack, then re-arrange the furniture - she had this crazy idea that he'd want to move into her room now. He agrees that the idea's crazy - “My room's bigger!” She points out that her room's cosier. They have a bit of a bicker before deciding to compromise and alternate between rooms (I bet that lasts about a week!) then make up with a kiss, to be duly interrupted by little brother Scott. He runs out and says he'll come back later but Paul shouts him back in. 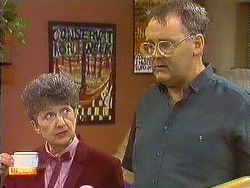 Scott welcomes them home, then says Mrs Mangel is on the warpath - she's worn out from all the work. Paul sighs and says they'll have to go into work, re-arranging the furniture can wait. But they'll call in and see Helen on the way. Helen is dabbing lotion on Henry's back. Madge is prepping veggies for dinner until Helen forces her out of the kitchen, telling her she'll be late for work. She is just leaving as Paul and Gail come in to surprise them all. Helen asks why they're back early and apologises to Gail for him being such a workaholic, but Gail insists she wouldn't have him any other way. Madge gets her bag to go to work and Paul asks her to give Harold a message - the glutaniam mining shares Harold bought have peaked and he should sell up. Madge asks him to sell her shares for her. 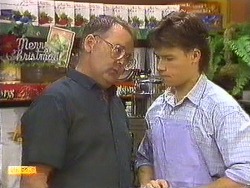 Mike and Harold are talking about Mrs Mangel seeing Bouncer waving. Harold thinks she's been working too hard. Madge comes in and Harold asks her if she wants to spend her Honeymoon in Europe - he can afford it with his shares. Madge passes on Paul's advise about selling but Harold thinks he knows better. He tells Mike they shouldn't be hasty, he's kept a close eye on the stock market and doesn't want to jump the gun. Scott is counting up the calendar money and tells Mike they did alright from it. Mike asks him what he'll do if he doesn't get a high enough aggregate to become a cadet but Scott's confident that he'll be okay - another nice little gap here for Mike to remind viewers with a bad memory that Scott was messing around with his wife's best friend at the time of his exams and consequently spent his revision time crying instead of studying. Doesn't dampen Scott's mood though, he's giddy with all that money. Mike wants more - he wants to buy a car and is going to use the money from the shares to do it. Harold gets off the phone to his stock broker mate and informs Mike that they'd be fools to sell up now. Mike is still unsure but allows himself to be convinced. Paul tells Jane if she doesn't go back to America to fulfil her contract then the cosmetics company are going to take her to Court for compensation - for $100,000!